Here at Benedetti Orthodontics in Fort Lauderdale we are committed to providing our patients with the most cutting edge treatments available. 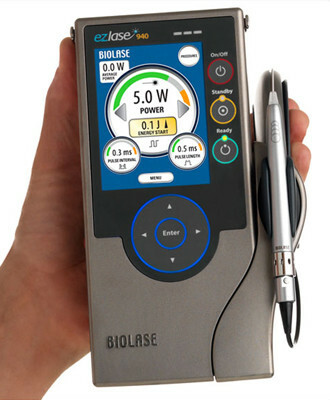 We now offer the latest advances in whitening technology with the Biolase eZlase 940 laser. This laser is used in conjunction with a patented Biolase LaserWhite whitening gel, which when activated, provides a bright, healthy new smile in only 20 minutes! Tooth discoloration is a common problem stemming from many different factors such as food, drinks, smoking and aging, but thanks to laser whitening, it doesn’t have to be a permanent problem. Unlike most other Fort Lauderdale laser teeth whitening systems which take around one hour or more, the eZlase laser whitening only takes 20 minutes to complete. Typically, the laser brightens teeth 6 to 12 shades, and the process can be completed in one visit. The laser provides a safe, effective and comfortable mean to whiten discolored teeth. A rejuvenated smiles revitalizes your self-confidence and self-image. The laser wavelength output is synchronized to the patented Biolase LaserWhite whitening gel, which increases efficiency and minimizes the amount of energy required to produce maximum whitening. This results in shortened treatment time and increases effectiveness while eliminating the heating of teeth that can result in post-operative sensitivity. Ordinary non-laser whitening systems require longer treatment times and higher energy output because of their inefficiencies. Non-laser whitening devices use just a tiny percentage of the polychromatic light’s energy. The rest of the energy is wasted as heat and light, which is absorbed by the teeth and adjacent tissues, which often results in intra-operative and post-operative sensitivity.